This Organza Flower Comb tells a romantic wedding story. The delicate design of crystals, pearls and that is a delight for the wearer, Let the light of the crystals add extra sparkle and class to your day. You can customise this piece to be added to your gown like a brooch. What a unique idea. Like sparkling stars in the sky, this bohemian organza flower comb will light up and delight you. Detailed organza daisy’s matched with bursts of crystals and pearls throughout. Let this light organza 3D lace hair piece be the design that dazzles in your hair on your wedding day. With folded fabric flowers and pearls scattered throughout. Easy to wear at the back of your hair placed at the top of your veil. Matches beautifully with an ivory or white dress and has a slight non-traditional vibe. Match with a pair of Chandelier earrings like our Round pearl drops or our crystal stud earrings like shown. 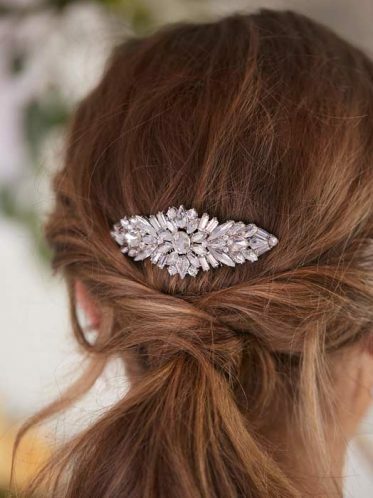 Other accessories you may also like are the Paris comb, Cinderella comb or the bohemian hair piece. This lovely floral comb comes presented in a pink Leah S Designs pouch, to keep it safe and secure for years to come.